Punk noir 20 years before Elvis Costello’s “Watching the Detectives,” set in the nameless bordertown of your nightmares. Punk noir 20 years before Elvis Costello’s “Watching the Detectives,” set in the nameless bordertown of your nightmares, this is one of those strange movies where the stars happened to align, even if in the form of a corpse among the constellations. The casting of Charlton Heston as a Mexican agent on the most frustrating honeymoon weekend of all time with bodacious newlywed Janet Leigh—she of breasts so lethally pointed that Madonna would build stage routines around them—has been a running joke ever since, never told with more glee than by director Orson Welles. In fact it was Heston who got Welles the directing gig, and it was Welles who then turned Heston’s character into a Mexican, the whole enterprise clearly dedicated more than anything to messing with people’s preconceptions (this was when Heston routinely played the likes of Moses and Andrew Jackson). As well there’s a grab-bag of misfits as unlikely as either Heston or Welles (playing a cop monstrous inside and out, as obsessed as he is corrupt) including Zsa Zsa Gabor as a madam, Joseph Cotton as a coroner, Dennis Weaver as a motel manager, Mercedes McCambridge as a lesbian hoodlum, and Marlene Dietrich as a gypsy with half the movie’s best lines. 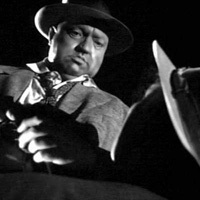 There have been at least four different cuts of Touch of Evil, the first by Welles and lost to the ages, the most controversial (and maybe definitive anyway) a 1998 edit based on a 58-page cri de coeur written by the director to the studio heads. Evil won the film festival at Brussels’ World Fair where judges like dazzled young turks Francois Truffaut and Jean Luc Godard, each a year from making his first movie, took note.